The strongest tropical storm to ever make landfall hit the islands of The Phillipines on November 8th. The current official figures estimate that over 10 million people have been affected. Approximately 4,000 are confirmed dead, with that number set to rise but unlikely to reach the original fears of 10,000. Around 4 million people have lost their homes, and less than 1 in 8 of these have access to shelter at an evacuation centre. Despite several of our project areas being hit, so far it appears that all sponsored children are accounted for. We will confirm this as soon as possible. However, food is extremely scarce, risk of disease is high, and children are traumatised and vulnerable to exploitation. Please consider donating to the Emergency Fund now. 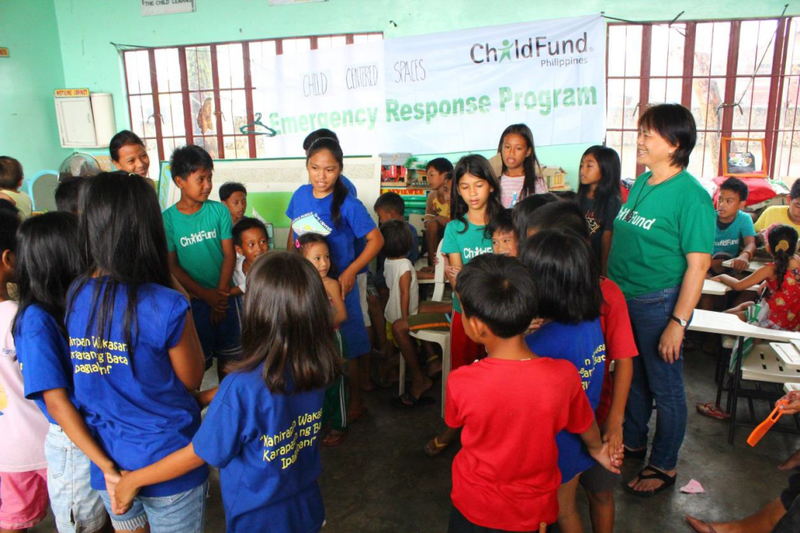 With an established presence in The Philippines, ChildFund’s response was immediate. And while aid poured into the city of Tacloban, ChildFund was one of the first to reach the less accessible Ormoc city, where our emergency assessment teams found 90% destruction of infrastructure. ChildFund was also recognised by UNICEF as the first organisation to provide child protection spaces in any of the affected areas. Based on rapid assessments all over the country, ChildFund is focussing its response on the hardest hit areas of Ormoc City, Tacloban City, Palo and Tolosa in Leyte, Bantayan Island in Northern Cebu and Roxas City. The entire population of about 100,000 families has been affected. Their most urgent needs are food and potable water. Main sources of food are the local market (although prices have risen significantly) and humanitarian aid from local and national government. About 25% of households still have food stocks, though these are expected to last less than a week. About 60% of the piped water system is working in Ormoc City. Water quality is at level 3 (drinkable). In rural areas, water is not drinkable. Affected families have water containers with lid available at household level used for water storage. There is a risk of water contamination; water purification/treatment is needed. Toilets and surrounding areas are not well lit due to lack of electricity. There is a need for personal hygiene kits. Diarrhea and respiratory diseases are main health concerns. Communication services are intermittent. There is no electricity in the city. Roads and bridges are about 90% passable. Public buildings have sustained major damage, including the city hall which was completely destroyed. The infrastructure damage is estimated at Php 224 million. There are security patrols to maintain peace and order. Schools are expected to reopen in 2 months. All 279 enrolled children are accounted for but most of them have damaged houses. The office of our local partner in Ormoc is severely damaged and inhabitable. About 95% of houses are severely damaged, requiring roofing materials (tarpaulins) due to exposure to rain. The mayor, LGU officials, and communities themselves have expressed to the ChildFund team that this is their main priority. As of November 18, there are already 3 CCS established in 3 evacuation centers in the city. While the CCS Tents are still on the way for delivery, what are being used are classrooms which were designated for children’s activities. UNICEF has committed to donate 4 CCS kits in the location. 1,000 packs of food items were distributed on November 18. ChildFund operates in 13 out of 47 barangays in Roxas City. All 897 ChildFund enrolled children in the city are accounted for. The entire city sustained heavy damage from the typhoon, affecting 12,123 people or 2,499 households. Nearly 5,000 children were affected. Around 13,758 people/2,855 families have been displaced and are living in evacuation centers. The ChildFund staff noted that many people only stay at evacuation centers at night. During the day they return to their homes and try to rebuild with whatever materials they can find. The city DRRM office estimates the number of totally damaged dwellings at 11,179 and partially damaged at 6,993. The total cost of damage to houses, agriculture, fisheries, and infrastructure is estimated at Php 622,029,136.00. They have confirmed 6 deaths, 11 injured, and 1 missing. There is still no electricity in the entire municipality, but cellphone network coverage has been restored. Potable water supply is running low. Aside from food and potable water, there is an immediate need for non-food items such as mats, blankets, mosquito nets, and tents. In a meeting with the ChildFund team, Capiz Governor Victor Tanco said that the provincial government has resources to provide needed relief goods. A number of socio-civic organizations have also arrived on the scene to provide relief goods. The LGU has decided to focus on providing temporary shelters and rehabilitation assistance for those whose homes were damaged. ChildFund has distributed 2000 food packs and 1000 non-food packs to 5 barangays: Cogon, Punta Cogon, Dumolog, Barra, and Libas. More food and non-food items are currently being procured and packaged for distribution. Barangays Culasi and Banica have been conducting CSS sessions for the last three days. These sessions consist of songs, games, artwork, and storytelling. A total of 378 beneficiaries participated on November 13, 168 on November 14, and 215 on November 15. A second batch of food and non-food items (1,000 packs each) were distributed on November 18.The Region VI Office of Civil Defense provided three vehicles, as well as two police escorts for each vehicle, to transport the goods from Iloilo City to Roxas City. Cases of two families with chicken pox have been reported in one of the evacuation centers. This was immediately reported to the City Health Office for immediate verification and action. 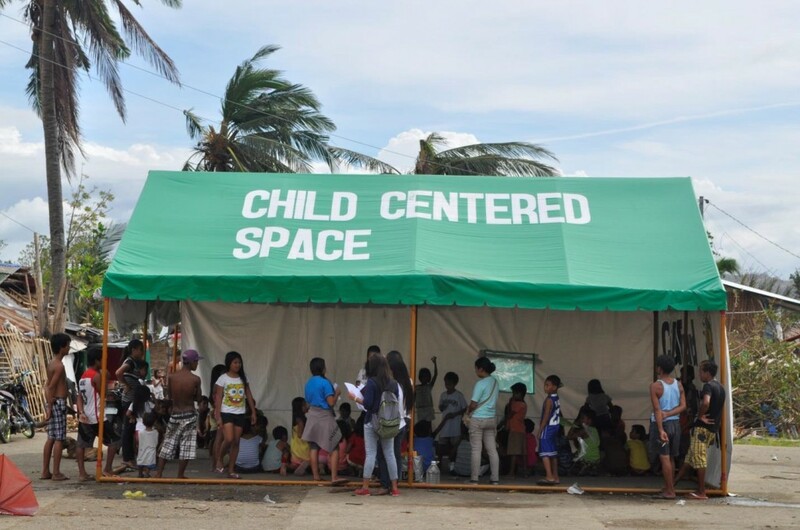 Sponsored children are accounted for at this stage, and ChildFund’s local partner conducted some Child-Centered Spaces activities for children and distributed bottled water in one evacuation center. Evacuees returned to their homes on Tuesday, Nov. 12. Meanwhile, the team in Iloilo assessed another municipality, Estancia, that needs assistance. It is the hardest-hit city in Iloilo Province, with 71 casualties and 39,000 persons affected. Tacloban bore the brunt of the typhoon but its survivors are beginning to pick up the pieces as aid pours into the city. There are now three functioning hospitals: EVRMC (DOH Manila team), St. Paul’s (Davao Medical Team) and, RTR (Cavite Medical Team). According to UN OCHA, the city’s water supply is operational. The Armed Forces of the Philippines will make available 6,000 litres of fuel for the city’s main water treatment plant to sustain supply for seven days. The United States committed additional fuel to support the operation of the treatment plant for 10 to 15 days. Water treatment units are needed for towns outside the city and in highland areas. The Philippine Red Cross in coordination with the water authorities will lead the coordination of water delivery services. On November 17, ChildFund team arrived in Tacloban after 3 days travel via the Bicol-Samar route. Rapid assessment was conducted in coordination with the different line agencies. As of this date, ChildFund has established a child protection presence in the largest evacuation center in the city i.e. Rizal Central School. ChildFund works in four of the nine barangays in Toboso. More than 1,200 families are in evacuation centers. All barangays were affected, with nearly 1,400 houses damaged, dozens of them destroyed. Thirty day care centers and 12 school buildings were damaged. There is no electricity in the city, and power will likely remain out until December. Food and non-food items (mats, blankets, mosquito nets) are needed. ChildFund is coordinating with the Social Welfare Office and the National Disaster Risk Reduction and Management Council. So far, ChildFund is the only organization coordinating with the local government unit, which can provide transportation for the relief goods. Community Watch groups (CWG), barangay officials and teachers also can be mobilized for relief operations. 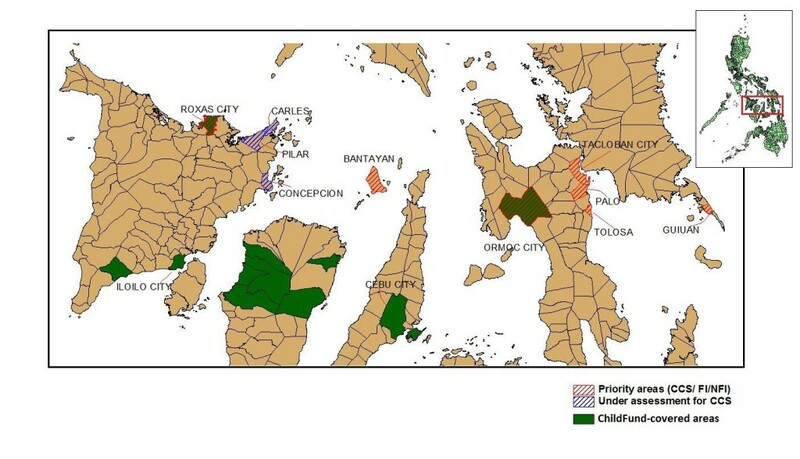 ChildFund works in six of the 17 barangays in San Carlos. The entire city, home to more than 13,000 people, was affected. The local government, which through the Social Welfare office provided relief goods in the evacuation centers during the typhoon, now is giving priority only to families whose houses are totally damaged. There is no electricity. Food and non-food items (mats, blankets, mosquito nets) are needed. ChildFund is coordinating with the Social Welfare Office and the NDRRMC. 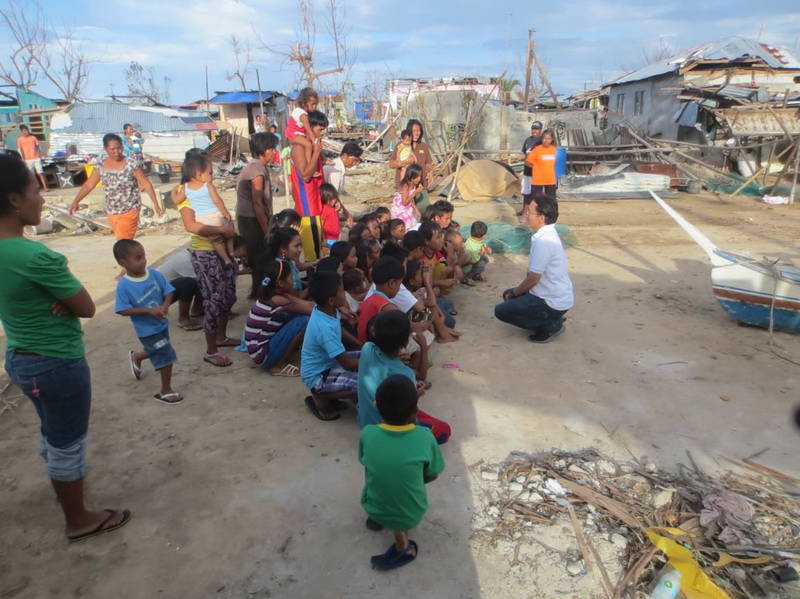 Bantayan Island is home to 20,569 families, all of whom have been affected. An estimated half of the population who were temporarily housed in evacuation centers have gone back to their communities. Almost 90% of the population left their house for temporary shelter and in search for food. Child protection and psychosocial activities are needed. Children have been observed unattended as their parents search for food. Some food packs, good for only 2-3 days, have been distributed by the local government unit. Food and non-food items are needed, particularly hygiene kits and tarpaulins that can serve as temporary shelters. The municipality has started to restore and rebuild blocked roads and facilities. There is still no electricity and potable water, but some businesses have resumed normal operations. Residents of coastal and islet villages where fishing and sea weed farming are main source of livelihood are finding it difficult to return to normal life. Fishing boats are damaged and seaweed farms have been wiped out. It will take months of considerable capital outlay to rehabilitate. On November 17, the team launched a CCS in Brgy. Suba with some barangay officials and parents. They conducted an orientation and some games with a total of 75 children and youth. 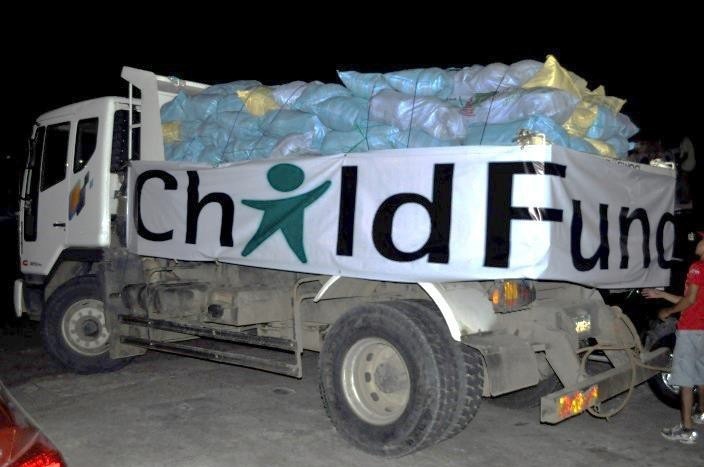 2,000 packs of relief goods from ChildFund will be distributed between November 20-22 in coordination with the LGU/MDRRM Office. They have already been delivered in the island. Classes have resumed on November 18, but only a handful of students have been coming to school. It appears that most students are not yet ready for regular classes. Students and teachers need debriefing and psychosocial support. The school principal has requested ChildFund to provide debriefing sessions to teachers so that they can be better prepared to help the kids recover from the sad experience after the typhoon. ChildFund is now coordinating with a local network or organization that has expertise on psychosocial and trauma sessions so that professionals can handle this. ChildFund will establish a CCS at Bantayan Central School CCS and conduct activities for 2- 3 weeks. This will slowly facilitate children’s transition back to the classroom. Another mobile CCS will be established catering to children below 5 years old. This CCS will go around the different affected islets because day care services are still suspended and almost all facilities are damaged. Tolosa is home to 17,531 people or 4,006 families spread out across 15 barangays. 869 families are currently living in 29 evacuation centers. Palo is home to 62,727 people or 12,571 families. 1,014 have been confirmed dead and 292 are missing. There are 2,199 persons or 559 families currently living in 6 evacuation centers. There is no electricity. Cellphone network signals are available in some barangays. 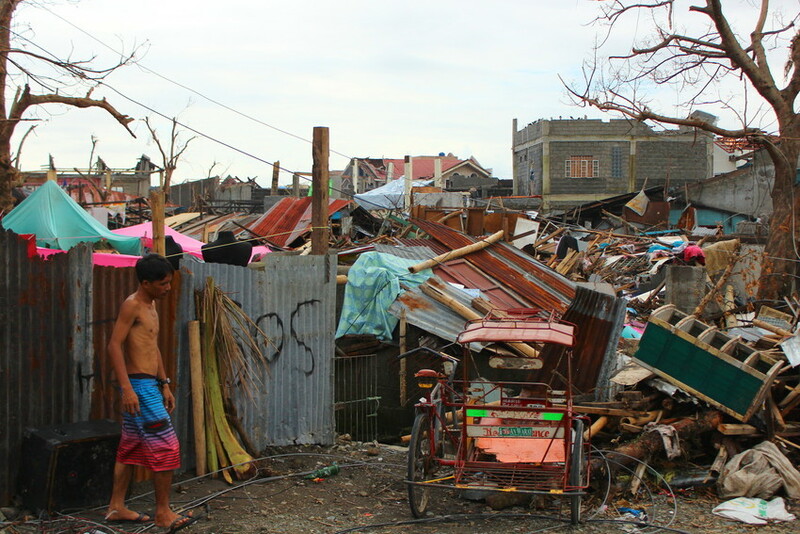 Houses, Schools, community chapels, community health posts, and barangay halls were all badly damaged. Commercial establishments are closed. No reports of storm damage, and our local partner organization in Western Visayas, CHILD Inc., has accounted for children in our programs. Thank you for your concern for the people of The Philippines. Please consider donating to the Emergency Fund.